This week the weekend challenge is to set long-term, mid-range, and short-term financial goals. These goals are important as you move on to set up your budget. They can determine how much you should save and where you can splurge a little bit. Look at your environment and create a supportive environment to help you reach your goals. Your finances affect often life goals and so it is important to consider financial goals on a regular basis. This process can help you take control of your finances, so even if you feel like you don't have time to manage your finances, take a few minutes to start the process toward financial freedom. If you are married, these are challenges you should work on together, especially as you write down your long-term financial goals. Write down three long-term goals. These goals should be twenty to thirty years away. They may include your retirement goals as well as other financial goals that you may have set for yourself. It helps to set up a firm amount that you need to save in order to achieve these goals. For example, I would like to retire sometime during my fifties and travel extensively. A good amount to save for retirement each year is fifteen percent of your gross income. This number can include employee matching programs. Choose at least three mid-range goals that you would like to accomplish in the next ten years. Depending on where you are in life, you may include a home purchase or paying off your mortgage. Other worthwhile ten year goals may be starting your own business, or purchasing real estate investments. It may be long-term career changes that will take time achieve or an income level that you would like to reach. Now it is time to focus on your short-term goals. These may be getting out of debt, saving for a vacation or a down payment on a house, funding your emergency fund, making a career change or increasing your salary. They may be as small and as specific as increasing your savings by $100.00 a month or cutting back on your grocery budget. These are the goals that you can achive during the year and possibly in the next few months. Starting to budget may be one of these goals. 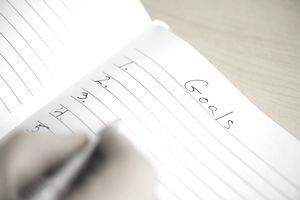 Finally, you need to go through and write down next to each goal three steps that you need to do in order to achieve that goal. For a retirement goal, you need to contribute regularly to your retirement savings. You may also need to find other streams of income, such as rental properties, that you can rely on once you retire. Finally, you need to set up a good financial plan to make sure that you reach these goals. You can plan to focus on finding additional streams of income after you have accomplished other goals such as paying off your house. It is important to realize that you will not take all of the steps you have listed this year, especially for your long-term or mid-range goals. Your short-term goals should be moving you towards reaching those goals. Your biggest goal should be your budget. This will help you reach your other goals. One goal everyone should consider is getting out of consumer debt. This frees up income and allows you to begin to save your money so that you can accomplish the things that are most important to you. As you set goals in other areas of your life, you need to include them in your budget planning. This will keep them from throwing your financial goals off and enable you to reach those goals too. Next week, we will set up a financial plan and a budget that will help you reach these goals. In the meantime write them down and put them where you can see them on a regular basis. It is important to remember what you are working toward. Your financial goals should be a guideline as you start budgeting and setting up your financial plan.